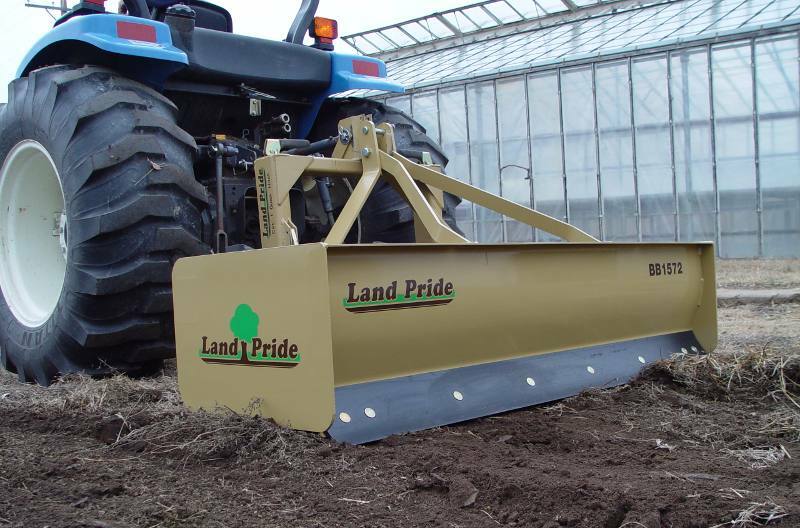 Land Pride's BB15 Series Fixed Bar Box Scrapers are ideal for ripping, leveling, finish grading, and backfilling applications at feedlots, outdoor arenas, and building sites, and for maintenance operations on farm and ranch lanes or roadways. Our BB15 offers five different working widths to choose from. The roll-formed moldboard keeps materials flowing which puts less drag on the Box Scraper, resulting in lower HP requirements and faster working conditions while the rear backfill blade allows for backfilling trenches or along foundations. 5/16” & 3/8” Heavy side panels: Built heavy to handle the tough jobs. 4 Position heat treated spring steel shanks: Offers flexibility for deep to shallow settings and Heat-treated for longevity. Roll-formed moldboard: Roll-formed moldboard keeps materials flowing which puts less drag on the Box Scraper, resulting in lower HP requirements and faster working conditions. 17” Moldboard height: High material capacity. Heat treated dimpled-on tips: Easy to replace tips that are heat treated for toughness. Category 1 3-point hitch with Quick Hitch capability: Fits a wide variety of tractors. Quick hitch capability allows for easy hook-up. Strong Bucket Reinforcement: Two welded braces extending from front to rear of bucket help keep the Box Scraper square under heavy loads. Depth of Bucket: 22 in.